Is it really almost 2019? That means it is time to think about what we did this year and what we want to achieve next year! It is time for New Year’s Resolutions! New Year’s Resolutions are a bit tricky. Some people have given up making them altogether. We like to pick some pretty tough goals. But this year let’s look at enjoying life more and expanding ourselves in the areas we love. Yep! Let’s make some Crochet New Year’s Resolutions! Let’s do this together. Share your goals with us. After reading all the New Year’s Resolutions listed below, print out the checklist located at the end of the post. Share a photo of your filled out checklist on any social media and use the hashtag #crochetersnewyear2019 and tag @windingroadcrochet and share it with us. You can also share it on our Facebook group at Our Crochet Journey. Then frame your checklist and hang it in your craft room, or tuck it in your crochet journal. Using up 100% is asking a lot but saying I will use up 50% or 25% of my existing yarn stash is a great goal. Honestly I have stopped buying yarn unless I have a project in mind. Most of the yarn I purchased because it was beautiful is still sitting in my stash. When I find (or dream up) a new project, I tend to go shopping for the perfect yarn. Rework this goal to fit you. Maybe commit to using one or two skeins of yarn from your stash a month, or commit to making a scrapghan (scrap yarn afghan). It is up to you. Do you need more scrap yarn patterns? Let me know in the comments below. Learning a new stitch is a great new year’s resolution! It is reasonable and obtainable. If you really want to challenge yourself, join myself and my crochet community in the February 28 Day Crochet Stitch Challenge! I will be sharing a new stitch tutorial each day in February and we will be sharing our sample swatches on Facebook and Instagram. Plus I have a few different Ideas on what you can do with your crochet stitch swatches. Just want to learn one new stitch with lots of potential? Come learn the Corner to Corner Crochet Stitch in my 3 month long C2C series, where I will cover everything there is to know about Corner to Corner Crochet. Sign up for my newsletter to be notified of when it is all happening or follow along on Facebook. Challenge yourself is a very personal New Year’s Resolution. You can challenge yourself in many different ways. Maybe you will tackle a bigger project than you normally would, like a blanket. You could try to make something that you have never made before, like a cardigan or sweater. Only you know what would be challenging for you. Be brave. Tackle something new. It is ok to fail, but it is good that you tried. This may be a hat, a scarf, or something more challenging like a sweater or cardigan. It also doesn’t even have to be for you. Your goals are up to you! This one maybe be a duplicate of the last goal or maybe it will be different. You decide. Are you a giver? Someone that constantly makes items for other people. Well maybe it is time to make something for yourself. It can be large or small, but you deserve to have a beautiful hand made item as well. Need some inspiration? Check out all my Free Crochet Patterns. Or see some of my most popular patterns below. (Click the photos to be taken to the pattern). We are very crafty and creative people. Sometimes we need to take a break from crochet and try something new. Spread or creative wings a bit. Now, I love to dabble in all sorts of craftiness, but recently I have given myself a new rule. I can try whatever craft I like as long as it is a yarn craft. My craft room is too stuffed, and I have so much yarn that I need to use up. I plan to dabble in weaving and maybe a little knitting this year. Let me know in the comments what crafts you may try. How is your yarn stash? Are you super organized, barely manageable, or just chaos? Well I hate to say that I am among the chaos when it comes to my stash. I try and try to keep it under control but something just goes amiss. It is among my New Year Resolutions to get my whole craft room under control so I can be a more creative and productive person. Is this the New Year Resolution for you? Share your love and passion for crochet with someone else. I am very grateful my Grandmother and Aunt took the time to teach me to crochet. It is a craft that I have enjoyed for so many years. One day I hope to teach my daughter and niece to crochet. Is there someone in your life that would love to learn? Take the time to teach them. They will be thanking you for years to come for sharing your craft with them. The beginning of the year is when a lot of designers announce their crochet a longs. If you have never done a crochet a long, they are a blast. You get to work a pattern with everyone else all at the same time and that means if you get stuck there is someone (many someones) to help you out! The crochet community is really a lot of fun to be apart of and this is a great way to get involved. Check out Moogly’s Year Long CAL. 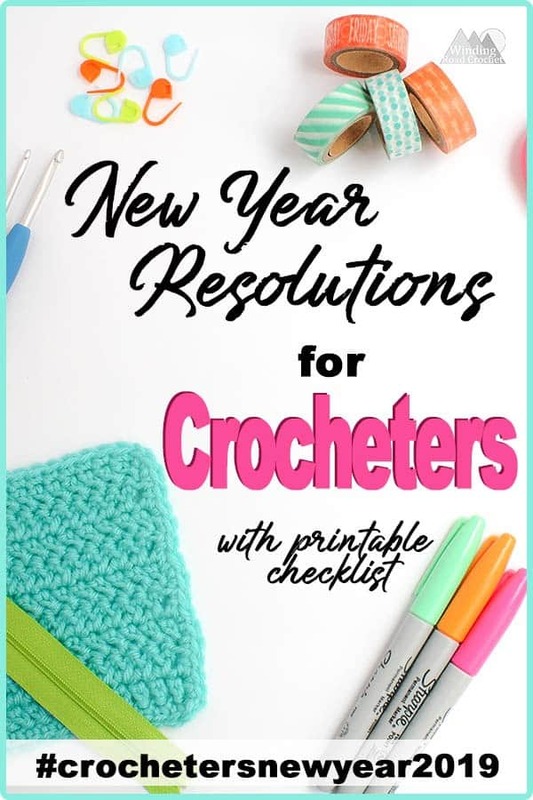 Here are some other ideas for crochet related New Year’s Resolutions. – Crochet for a Charity. -Try a New Type of Yarn. -Crochet something you have never crocheted before. -Invest in a really good set of hooks. -Finish all Work in Progress projects from 2018. Did I miss any new year’s resolutions that you had in mind for 2019? I would love to know what is on your goals list. Let me know in the comments below or print out the checklist and share a photo with me on social media! The checklist has an extra spot to add your own goal. Don’t forget to tag me @windingroadcrochet and use the #crochetersnewyear2019 . I am looking forward to see what you add. Remember to keep your goals reasonable and obtainable. Just like finishing a crochet project, completing a goal will give you a great sense of accomplishment. You can do it! Let’s have a great year in 2019! I want to spend 2019 with you! Subscribe to the newsletter so I can share with your free patterns, tips, and inspiration. Written pattern, tutorials, graphs and pdfs of New Year’s Resolutions for Crocheters are copyright Windingroadcrochet.com. Please do not reprint or repost this content as your own, but please feel free to share this link with others. You can find more information on sharing my work with others in the Terms and Conditions Page. I am going to try my hand at drop spindle spinning yarn and weaving. I like your list. It’s something I try to do all the time. I would like to learn to spin and felt kitty beds. If you want people to follow you on Pinterest or Instagram, you should post links. The majority of people are not going to search. Thank you for the feedback. This is my first time using this system to run a giveaway on my blog. I have adjusted the entry form to include the links. I was not aware I could add links when I set it up, but I learned something new! Wonderful. I will be posting the beginnings of the C2C tutorial late this week or early next week. I am considering running it as a unstructured Crochet A Long because I have so many that want to learn and I think it will be more fun to learn together. Then consider joining us for out 28 Day Stitch Challenge in February. You don’t actually have to try all 28 stitches, but you can try out the ones you like and share it with our community. This is brilliant, exactly the thing I need to get my behind in gear. Thanks Lyndsey. Tunisian crochet is high on my list, I’ve had a few practice runs but I really want to make a few projects using this technique this year. This is great because I have seen so many adorable c2c patterns and i have been wanting to try this technique! I ma so happy I won your giveaway!! I will definitely be making them and they have already been added to my list for this year. Thank you again and Happy New Years!